Kiton tie in silk with boxes and diamonds print. Traditional seven-fold construction. Approx. 58"L; 3.4" at widest. Handmade in Italy. 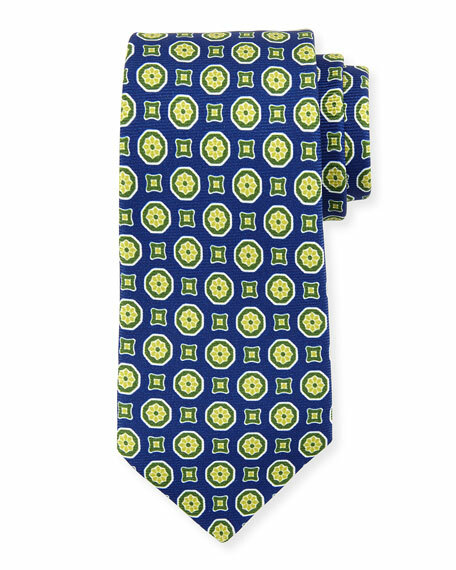 Kiton tie in fancy ovals motif. Approx. 58"L; 3.4" at widest. Silk; dry clean. Made in Italy. Kiton tie in silk with large pine print. Traditional seven-fold construction. Approx. 58"L; 3.4" at widest. Handmade in Italy.